Top: Nicht view o Zurich frae Üetliberg, Middle left: National Museum, Middle right: Swiss Federal Institute of Technology, Bottom: View ower Zurich an the lake. Zurich (German: Zürich, German pronunciation: [ˈtsyːrɪç]; Swiss German: Züri) is the lairgest ceety in Swisserland an the caipital o the canton o Zurich. It is locatit in central Swisserland at the northwastren tip o Lake Zurich. 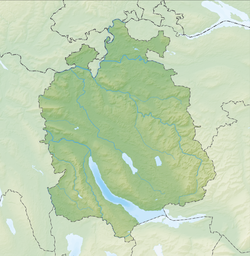 While the municipality itsel haes approximately 390,000 inhabitants, the Zurich metropolitan aurie is an urbanisit aurie o internaitional importance constitutit bi a population o nearly 2 million inhabitants. Zurich is a mixed hub for railways, roads, an air traffic. Baith Zurich Airport an railway station are the lairgest an busiest in the kintra. Permanently settled for aroond 7,000 years, the history o Zurich goes back tae its foondin bi the Romans, who, in 15 BC, cried it Turicum. Durin the Middle Ages Zurich gained the independent an privileged status o imperial immediacy an, in 1519, wis the place o oreegin an centre o the Protestant Reformation in German-speakin Swisserland, led bi Ulrich Zwingli. Zurich is a leadin global ceety an amang the warld's lairgest feenancial centres. The ceety is hame tae a lairge number o financial institutions an bankin giants. An aw, maist o the research an development centres are concentratit in Zurich an the law rate o tax attracts owerseas companies tae set up their heidquarters there. Accordin tae several surveys frae 2006 tae 2008, Zurich wis namit the ceety wi the best quality o life in the warld as well as the walthiest ceety in Europe. An impressive number o museums an airt galleries can be foond in the ceety, includin the Swiss Naitional Museum an the Kunsthaus. Zurich hosts ane o the maist important theatres in the German-speakin warld an aw. The Swiss staundart German pronunciation o the name is [ˈtsyːrɪç] ( listen). In Zurich German athoot the feenal consonant, Züri [ˈtsyɾi], although the adjective remains Zürcher [ˈtsyrxər]. The ceety is cried Zurich [zyʁik] in French, Zurigo [dzuˈriːɡo] in Italian, an Turitg [tuˈritɕ] in Romansh. In Inglis an Scots, the name is uisually written Zurich, athoot the umlaut. It is pronooncit /ˈzjʊərɪk/ (ZEWR-ik) or /ˈzʊərɪk/ (ZOOR-ik); mair recently sometimes wi /ts/ as in German an aw. The earliest kent form o the ceety's name is Turicum, attestit on a tombstone o the late 2nt century AD in the form STA(tio) TURICEN(sis) ("Turicum tax post"). Neither the name's linguistic oreegin (maist likely Rhaetic or Celtic) nor its meaning can be determined wi certainty. A possibility is derivation frae *Turīcon, frae the Gaulish personal name Tūros. The stress on the lang vowel o the Gaulish name, [tuˈriːkon], wis lost in German [ˈtsyːʁɪç] but is preservit in Italian Zurigo [dzuˈriːɡo]. A first development towards its later, Germanic form is attestit as early as the 6t century wi the form Ziurichi. Frae the 10t century onward, the name haes mair or less clearly been established as Zürich (Zurih (857), Zurich (924)). Zurich is sometimes referred tae as "Downtown Swisserland" for publicity raisons. ↑ "Zurich entry at the Swiss Tourist Board". Myswitzerland.com. Retrieved 2010-07-03. ↑ "2007 World-wide quality of living survey". Mercer. 2007-04-02. Retrieved 2008-08-08. ↑ "Mercer's 2008 Quality of Living survey highlights". Mercer. 2008-06-10. Retrieved 2008-08-08. Wikimedia Commons haes media relatit tae Zürich.